Before the days of Vegas revues, commercial endorsements, and RuPaul’s Drag Race, the glamour and beauty of drag often hid a rough business. As Flawless Mother Sabrina (née Jack Doroshow) recalls, “I actually have a list that shows all the states and all the various penalties… it was a felony—cross-dressing was a felony!” Locked up more than once for her pioneering work as a performer and pageant promoter, she remains humorous about her place in history. Subject of the 1968 documentary The Queen, which details the behind-the-scenes drama at the Miss All-American Camp Beauty Pageant, Flawless Sabrina began her career in the late-’50s when merely the hint of being gay could destroy a life. A frank snapshot of attitudes toward race, sexuality, and gender, The Queen was given an X rating at the time, due to its then-taboo subject matter. Rarely screened, but important as a historical record, the documentary is a lesser-known forerunner to Jennie Livingston’s Paris Is Burning, capturing a moment of pre-Stonewall history that had long been hidden from American popular culture. Particularly marked in the history of drag-as-entertainment is the chasm between public performance and personal self-expression. Police in major cities may have turned a blind eye to female impersonation in theatrical or cabaret settings for mainstream audiences, but the underground circuits of performance for the LGBT community were under constant risk and scrutiny. TV history is especially full of examples where “realness” was a factor: Milton Berle frequently appeared in drag in one of the medium’s first hit shows, but a less masculine, more passable female impersonator would be unthinkable. “It didn’t even qualify to be discussed in the toilet, to tell you the truth,” Sabrina says. Beyond being merely cheeky, campy fun, choosing to perform in the “backroom” contests Sabrina was creating was dangerous, subversive, and grounds for arrest in most states. In another moment that captures the temperature of the cultural landscape, The Queen introduced audiences to a young Crystal LaBeija, who would go on to establish the legendary House Of LaBeija and appear in Paris Is Burning. Although they would go on to become friends “in time,” Crystal’s cameo in The Queen is notable for her accusations of racism in the pageant-judging process. Despite its outside appearance of glamour and fun, the drag world was America in microcosm, struggling to come to terms with a changing world. In mere months the Stonewall riots would launch the cause of gay rights into the mainstream, along with other hard-fought civil rights movements. “I think there’s a very important legacy there,“ says Sabrina. “Because Paris Is Burning addresses the houses and the houses did a lot more than just accommodating a roof over their heads. Crystal started House Of LaBeija, which was the first of the houses, and that was about getting medical attention for the girls and some sort of structure for getting protection around the girls—and the whole history around the houses was really about having some sort of community support around the whole thing of gender variance.” A critical and commercial success, the documentary opened up the world of drag balls to an audience that would otherwise have no contact with these more marginalized events. Its influence would be felt for years afterward in pop culture, with the subculture’s fashions, dance, and even language being co-opted by popular artists such as Madonna, who both sanitized it and made it acceptable to wider audience. That, in turn, may have laid the groundwork for RuPaul’s own career. By the 2009 premiere of Drag Race—which begins its seventh season on March 2—the overall cultural landscape was vastly different and the show was a huge hit, launching the careers of many of the contestants and bringing RuPaul even more attention as a performer and activist. It’s a success Sabrina applauds wholeheartedly. “I love it,” she says. “I think it’s brilliant. I think RuPaul’s made it. 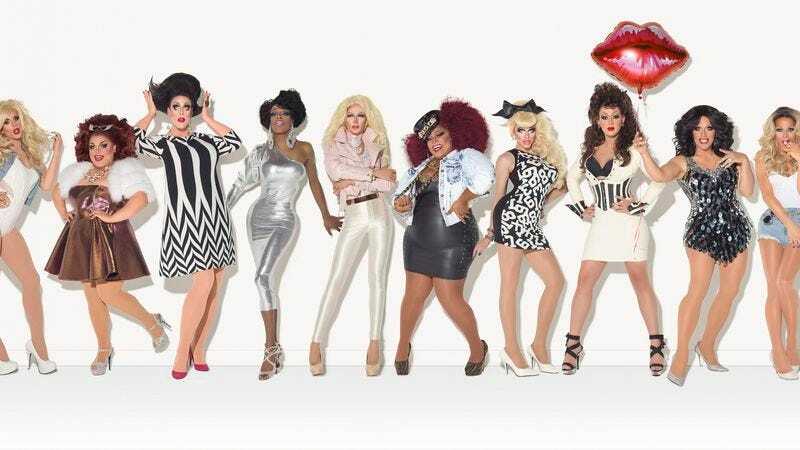 I think RuPaul’s very smart and I think it’s a thing that’s very culturally important, because it’s reached a mass audience.” While a good step forward, Sabrina understands that in many ways American TV watchers are still adjusting to the changing tides of race and LGBT rights—movements that have made great strides forward, but still have a long way to go. “I think RuPaul being let into people’s homes on television might be a lot safer than finding out that they have a little RuPaul growing up in their own home. I think that cultural divide is just as fresh as a daisy.” Sabrina cites the recent suicide of trans teen Leelah Alcorn as an example of the continuing struggle for many gay and trans people to establish an accepted public identity. The Lady Aye appears onstage as “The Sweetheart Of The Sideshow,” writes about pop culture from her native NYC, and would make a charming talk show guest. A thoroughly modern woman, she is also on the twitter at @theladyaye.